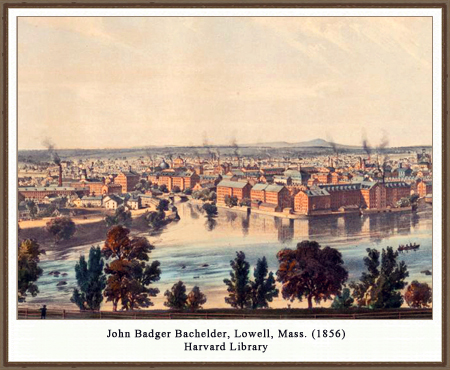 Perchance, after a few thousands of years, if the fishes will be patient, and pass their summers elsewhere, meanwhile, nature will have levelled the Billerica dam, and the Lowell factories, and the Grass-ground River run clear again, to be explored by new migratory shoals, even as far as the Hopkinton pond and Westborough swamp. Visit the Tsongas Industrial History Center at UMass Lowell. Visit the American Textile History Museum. 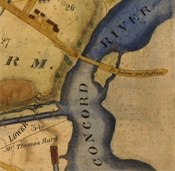 When Thoreau and his older brother, John, took a trip up the Concord and Merrimack Rivers in August 1839, they went around the city of Lowell by taking advantage of the Middlesex Canal. 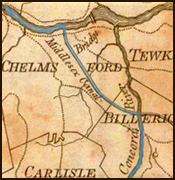 Completed in 1801, the Canal extended 27 miles from Charlestown to Middlesex Village in Chelmsford. During its initial years in operation, the waterway was touted as an engineering marvel that would revolutionize trade and travel. But as Thoreau observed, it quickly assumed an "antique look" as rail lines multiplied during the 1830's, and freight trains replaced boats and barges in commercial transportation. 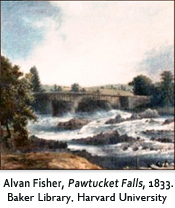 The Thoreau brothers were, however, still able to enter the Canal just above Billerica Falls to travel six miles to the Merrimack River in just over an hour. "It is a rapid story the historian will have to put together. 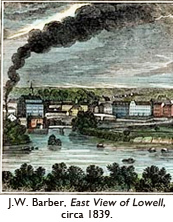 Miantonimo, — Winthrop, — Webster. Soon he comes from Montaup to Bunker Hill, from bear-skins, parched corn, bows and arrows, to tiled roofs, wheat-fields, guns and swords. 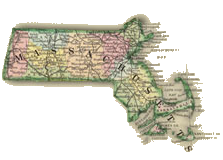 Pawtucket and Wamesit, where the Indians resorted in the fishing season, are now Lowell, the city of spindles and Manchester of America, which sends its cotton cloth round the globe. Even we youthful voyagers had spent a part of our lives in the village of Chelmsford, when the present city, whose bells we heard, was its obscure north district only, and the giant weaver was not yet fairly born. So old are we; so young is it." "I remember very well on one occasion, some years ago, when listening to a lecture by a late Concord scholar and philosopher, to have heard a most entertaining denunciation of those who find satisfaction in reading the mere news of the day; and I was assured by the speaker, so indifferent was he to what was going on outside of himself and the things he deemed of practical value, that he would not go to the corner of the street to see the world blow up! ... To be sure the Concord man was by some people called "a child of nature," and took special delight in lying around on mother earth, indolently watching the active squirrels, the habits of fishes, and characteristics of bugs and things; and I suppose he had a right to be indifferent to what was going on in the world among his fellowmen, and to spend his time as he pleased, if he paid taxes, but he didn't—willingly. But the doubt his remark called up has ever since beset me," Z.E. Stone, "General Jackson in Lowell," Contributions to the Old Residents' Historical Association of Lowell (June, 1879), 105. 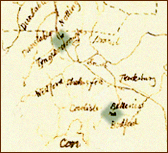 View Thoreau's map of his 1839 excursion on the Concord and Merrimack Rivers. 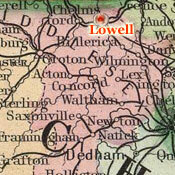 Visit Lowell Parks and Conservation Trust. Explore the UMass Lowell Climate Change Initiative. Visit the Mogan Cultural Center. Explore the Concord River Greenway. Meet the Merrimack River Watershed Council.